The applet below illustrates a solution to the traditional Butterfly Problem that was communicated to me by Giles Gardam, a member of Australia's 2007 and 2008 IMO teams, and is due to his mentor, Ivan Guo, who won a gold medal at IMO 2004. 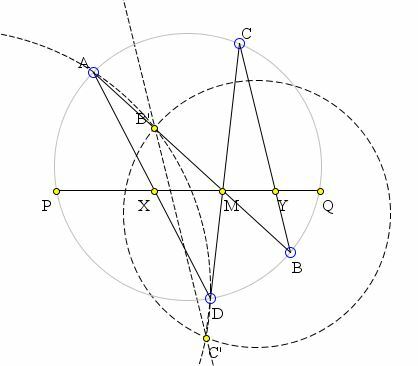 In a circle T, two chords AB and CD intersect at the midpoint of a third chord PQ. AD meets PQ in X, BC meets PQ in Y. The task is to show that M is also the midpoint of XY. Among the many browsers currently available, the Firefox is the one that - with sufficient permissions - still runs Java.